The purported Taliban intention to hold talks with the government and the government’s desire to bring the talks to some logical conclusion have fallen flat owing to mismanagement and lack of trust between both the parties. The inevitability of the lack of trust cannot be argued about any further. 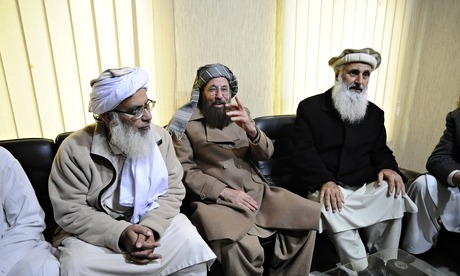 The frustration of Chaudhry Nisar with the Taliban’s committee for its flip flop method of working out a peace deal has revealed the absence of common areas of interest between the government and the Tehreek-e-Taliban Pakistan (TTP). Whatever has been done to appease the TTP by the government such as releasing its prisoners without reciprocity has failed to make any difference. Even when the ceasefire had been in place, the attacks never stopped. Low intensity hits were carried out to keep the government off-balance. The so-called dialogue process does not seem to have reduced terrorism. The policy of retaliation for any deadly attack, as has happened in the aftermath of the Islamabad fruit market explosion, seems to be the reason behind the relatively calmer atmosphere. Now that the TTP has pulled out of the ceasefire agreement and the Jamaat-e-Islami has said rather loud and clear that the Islamic clauses of Pakistan’s constitution should be implemented, the failure of the peace process has started looming. It seems that unless the dialogue toes the TTP’s line, the ambiguity surrounding the peace process would keep growing thicker. It is this ambiguity or the political objective of the Taliban’s committee that has forced Major Amir to pull out of the peace dialogue as one of the government’s mediators. According to Major Amir, a claim reinforced by Chaudhry Nisar, the Taliban are less to be blamed for the stalled dialogue than its negotiating committee that had been playing to the gallery for point scoring. It seems as if the Jamaat has taken over the lead position, huddling the mullahs together to decide about the fate of terrorism vis-a-vis the state. Of late the tension between the government and the army over managing the TTP had been exploited as well to stall the talks. The demand that the army is given centre-stage, suggesting that it is the army calling the shots and the government is simply hiding behind a facade, created even more confusion. For the unpredictability surrounding the peace dialogue, the government is to be blamed the most. If the desire is to keep violence at a minimum by keeping the TTP engaged in dialogue so that peace could be maintained, the government is digging a deeper grave to bury the country’s future. Next The Silence of Muslims is Haraam!